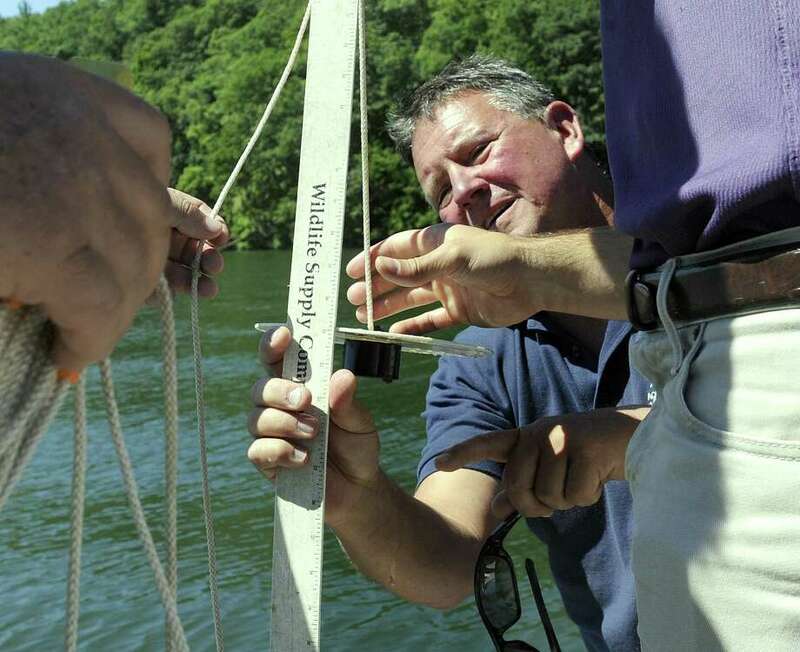 Larry Marsicano, a limnologist and former executive director of the Candlewood Lake Authority, measures water quality last week . SHERMAN — Looking out on the water as her boat drifted further into Candlewood Lake, Lake Authority Chairwoman Phyllis Schaer recalled how a few years ago the now nearly clear waters were overrun with invasive Eurasian milfoil. “It looked like you could walk across it,” Schaer told a group of advocates and legislators gathered for a meeting on the boat recently. Federation of Lakes to celebrate the state’s Lakes Awareness Week. Representatives from four of the area’s lakes — Ball Pond, Bantam Lake, Lake Lillinonah and Candlewood — joined in the meeting to share issues, solutions and ideas with one another and two of the state’s lawmakers, Sen. Craig Miner, R-Litchfield, and Rep. David Arconti Jr., D-Danbury. The most popular topic of the day seemed to be how the local lake groups have dealt or are dealing with various invasive species, including milfoil, zebra mussels, fanwort and, perhaps the most relevant, blue-green algae. Larry Marsicano, former Candlewood Lake Authority executive director, who now works as a lake consultant, said the algae blooms, which can be toxic, are the most common emerging problem. He told the group that research he and others are working on show that certain changes in the climate are giving the blooms an advantage over other species. Marsicano said solutions to controlling the blooms include different ways to manage the causes, such as high nutrient levels. This can include new technology for septic systems and advocating for low-impact development surrounding the lake, such as vegetative buffers so harmful run-off doesn’t make its way into the water. Another option is to use chemical treatments, such as copper sulfate, which the Bantam Lake Protective Association decided to apply, said president Connie Trolle, who is also president of the CFL. Chemical and herbicide treatments also helped Bantam control milfoil and fanwort, Trolle said, but the group is looking for more long-term solutions. Greg Petriccione, chairman of the Lillinonah Lake Authority, said some residents have gotten permits to use herbicides on the lake, but the authority is struggling to make sure they adequately publicize the treatment. “They did it and that’s fine, but the issue is they need to follow the law (with postings),” he said. On Candlewood, former New Fairfield officials had proposed using herbicides to treat blue-green algae and milfoil, but ultimately abandoned the idea after residents advocating against it passed an ordinance to block the plan. The carp, added to eat milfoil, have been successful in managing the weed in Candlewood and nearby Ball Pond, said Schaer and Ball Pond Advisory Committee member Gary Mummert. The lake representatives also discussed with legislators whether state-level solutions could be possible for invasive species or other lake challenges. Miner and Arconti told the group about a bill they are trying to pass, for the second year, that would provide funds through an existing Community Investment Account to combat invasive species.